I carry a great weight. I have a feeling that you might carry it too. I feel it in my skin. I know that’s vague, but my skin has this heavy feeling. Each breath takes additional energy these days for the rise and fall of my chest, pushing through what seems to be holding everything down. I sense it in my smile. While usually genuine, I have moments when I release the smile and realize it was forced, a mask to not just convince those around me, but to convince myself that everything is okay. Why do I have to convince myself of this? Do you ever find yourself thinking, “I am a failure” or “I can’t handle it all”? Are you afraid that you are one big fake, and someone is going to find out sooner or later? I never consciously tell myself I am a failure. But I know I am wrapping up that one awful word – failure – in colored tissue paper of trying harder and pushing through and attempting to juggle more than I can keep in the air. And as I try to think back to a time in my life when I didn’t feel this way — I can’t. In high school, I felt lonely, so I spent all my energy trying to meet high standards in school and sports, hoping that would lead to contentment and identity and worth. In college, I saw my grades and my relationships and my ministry as a result of my own striving, leading to senior year burn out and wondering what it was all for, what it meant about me. A breeze blows across the patio, and I feel it slowly coax away the weight. 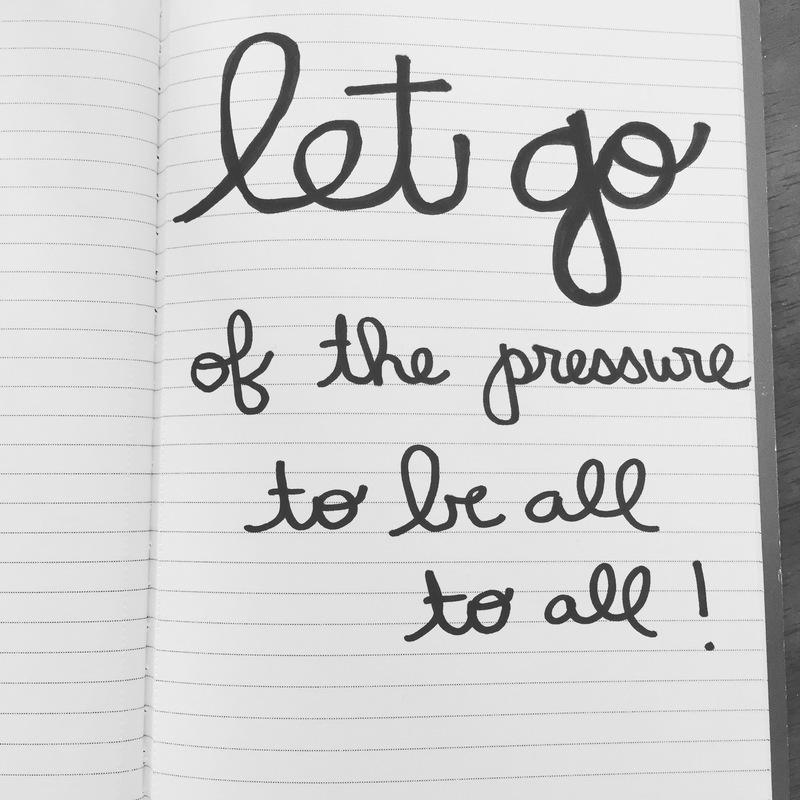 I write these words on paper, ignoring the restrictions of lines on the page: Let go of the pressure to be all to all. I see the silliness in that concept – how could someone be all to all? But I didn’t realize that was the weight I was carrying until my pen revealed it in ink. Big and bold and curvy, I trace and re-trace the letters. I hear God – maybe not audibly, but I hear Him in how my thoughts continue to unwrap this statement. Stop thinking that it’s all up to you – to maintain friendships, to manage your home, to make progress at work. Let go. Breathe out the weight, breathe in grace. How self-centered is that, to think that I am the one who makes it all happen? “I am the only reason I have friends and those friends feel loved. My efforts are needed to keep the world going round. I am the answer to all of the questions being asked.” Not only is that egocentric, but it is too much pressure for one person to hold. Do you recognize that for yourself, too? It’s okay that you can’t carry it all, but I know you are still trying. No wonder we feel our souls collapsing into depression or anxiety or workaholism or addiction in its various forms. As much effort as I exert in each area of my life, I feel like I am failing somewhere. I can’t make straight A’s. And I am sick of feeling like I am failing when I am exhausted from trying so hard. Your very breath that indicates life is breathed because of Him in you. Even the most basic of life requirements is not something that you can accomplish on your own – and that should bring freedom. So I am making the conscious decision to give up. To confess to the world and – more importantly – to myself that I cannot do it all. I want to relish the grace available in this confession. I want to immerse myself in that grace like a child who has just raked a yard full of leaves together for the sole purpose of scattering them with that one jump. It doesn’t quite make sense, as she will probably have to rake them again, but it’s not about efficiency or logic. The beauty of grace is that it doesn’t make sense, but it is a gift meant to be enjoyed. I am going to breathe more easily this week. I am going to surrender to my own limitations. And I am going to jump all in to grace, watching leaves fly and laughing in the child-like freedom found in grace.